The old West Scenic Bikeway is the longest state-established bikeway in Oregon and may well be the most scenic and bike friendly of all. 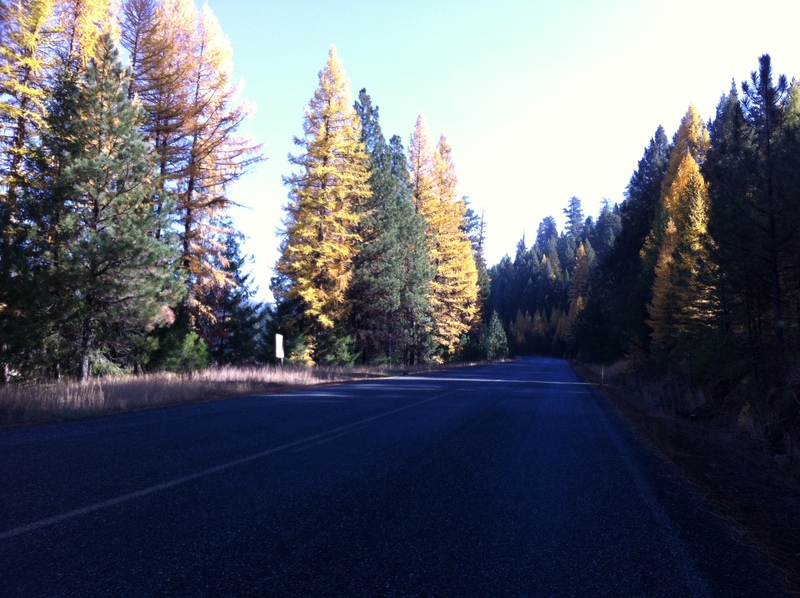 Making a sweeping loop in eastern Oregon, it covers 177 miles with about 9000 ft. of climbing. I rode this same four day tour last fall around the same time with a trike riding friend, Paul Carew, and it looks like this will become an annual event on my calendar. 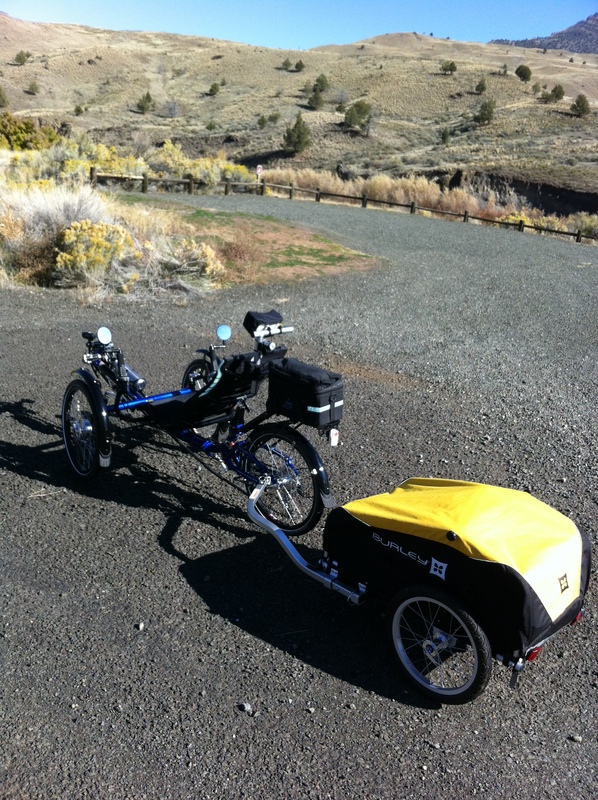 This year I went solo, picked another trike, and used a trailer instead of panniers. Most of the roads this route follows are on low volume rural paved roads with regular opportunities for food, water, and camping along the way. 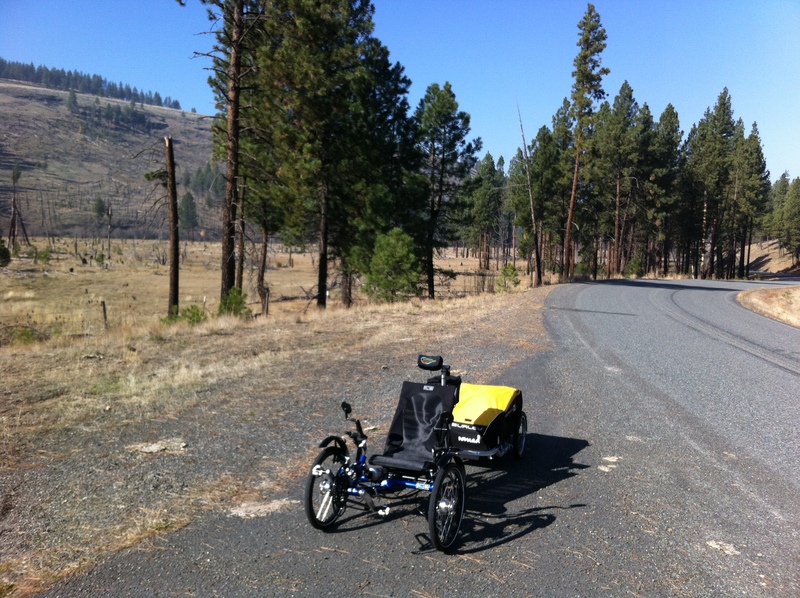 Both years I chose to ride a recumbent trike and it was interesting to compare the different models I rode, as well as evaluating going solo vs. riding with a companion, and using a trailer vs. panniers. Last year I took one of my favorite trikes for touring, a Greenspeed GT3 with Arkel RT 40 panniers; this year I rode our shop ICE Adventure FS demo, pulling a Burley Nomad trailer. I enjoy trying different things, partly for my own interest and partly to expand my experience base so I can relate real world testing of gear to help give the best advice to our shop customers. Both trips, I’ve had perfect sunny fall conditions, although getting a bit nippy at night. Last year we had more favorable tailwinds which helped get my average speed close to 13 mph, but both years the temps fell to the low 30s/upper 20s at night. This year I decided to bring a warmer sleeping bag—I bought a 6 degree down Sierra Designs bag right before leaving and it actually proved to be a bit too warm. I also brought a warmer down jacket which made hanging out around the fire at night and getting out of my sleeping bag in the morning more tolerable. 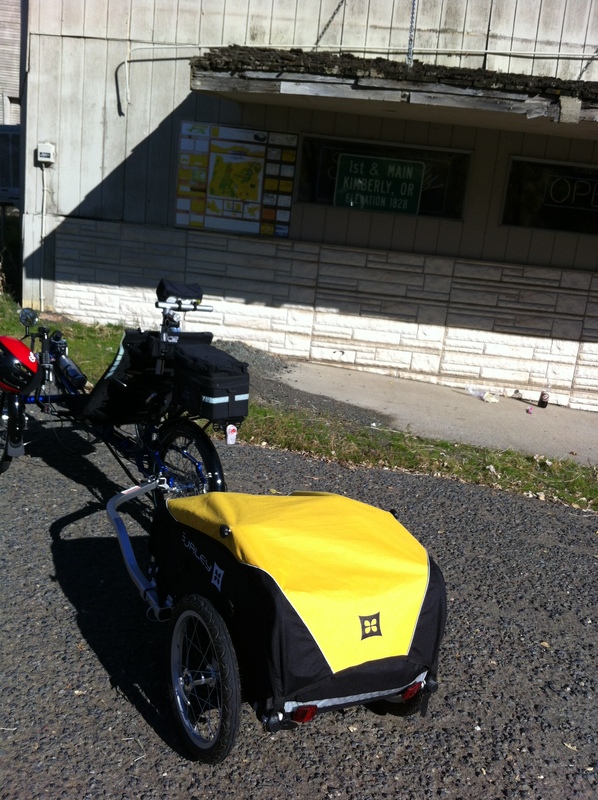 Because of the bulkier cold weather gear, I decided to use a trailer instead of panniers. 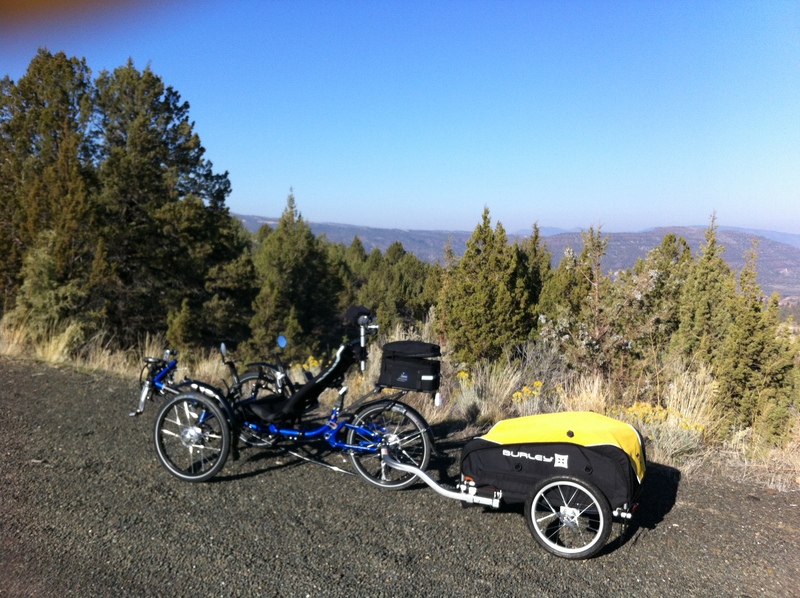 The limitation of most trikes for touring is the capacity to carry only one set of rear panniers, so you end up piling gear up on top of the rack, not great for keeping your center of gravity low. 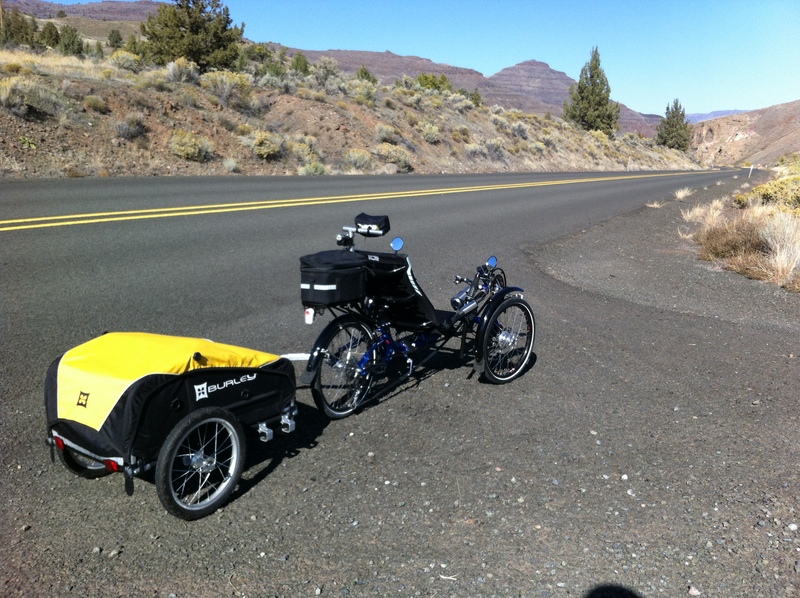 I’ve used the Burley Nomad before on an 800-mile winter tour I did in Florida a few years ago. Trailers can be a bit cumbersome at times but having the ability to toss your gear into them, like loading a big car truck, makes for easy packing and access. The usual way to ride this loop is counter clockwise, but I prefer to go clockwise, making use of the wind direction by keeping it at my back. Going clockwise also makes the camping space out perfectly for the 40-45 mile days. 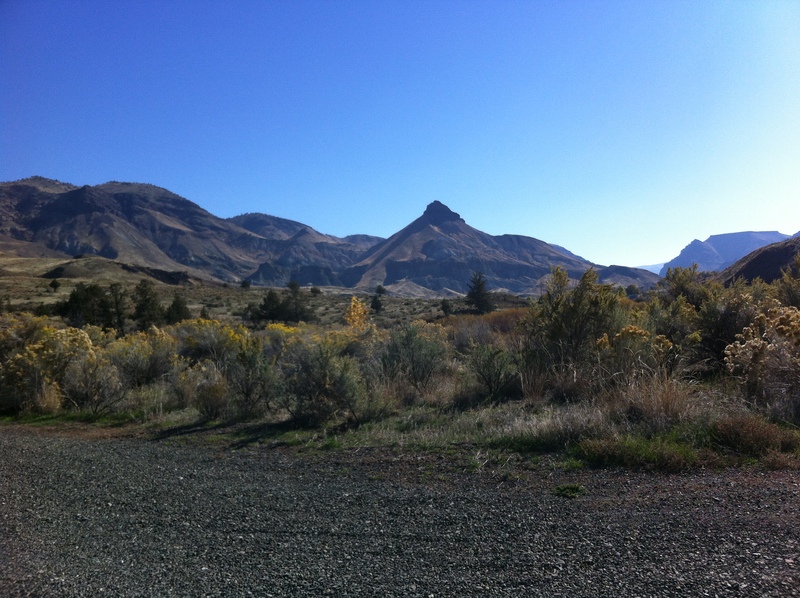 Day 1) I parked my car in Dayville at the bicyclist friendly church in town and hit the road. Last year, riding with my buddy Paul, I was pushing the pace more, not wanting to hold him up (even though he still was waiting for me a few minutes at the top of most of the climbs. I can never keep up his blistering pace on hills—my suspicion is he has a tiny motor hidden somewhere on his trike, but I haven’t found it yet). My goal this year was to ride at a comfortable touring pace and enjoy the scenery, which was stunning. The cottonwoods and larch trees were in full yellow fall splendor. 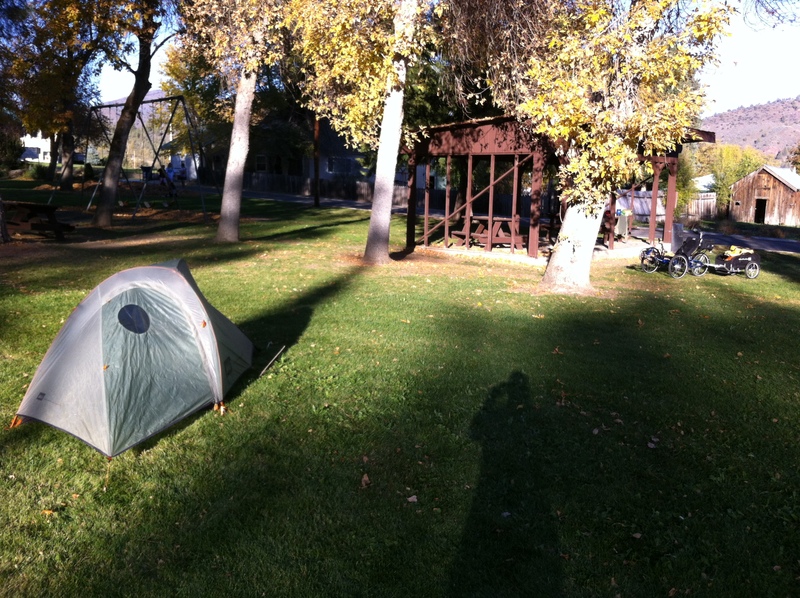 I spent the first night in the town of Monument in the city park. There’s a great little grocery store there where I picked up some less than healthy dinner and turned in at sundown. 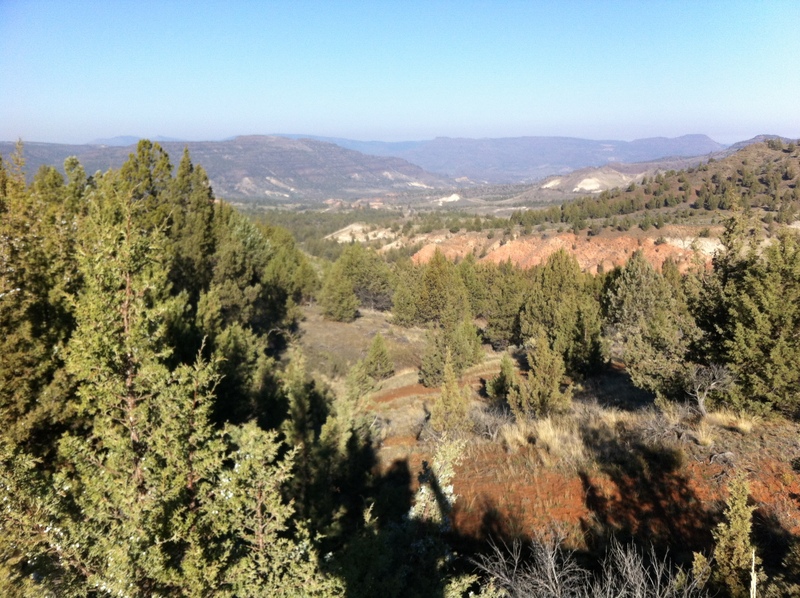 Day 2) The day’s work started out pretty much right off the bat with a 2200 ft. climb. Grinding steadily up out of the valley, the views got quite spectacular with fall colors everywhere the eye could see. After about an hour and a half, I topped out to ride down to the little town of Long Creek and an awesome burger at the Long Creek Cafe. One of the wonderful things about this tour, in addition to the beautiful country it goes through, is the lack of traffic on most of the roads. Except for highway 26 and 395 (both of which mostly have a nice wide shoulder), there are so few cars that pass by, you might think you are riding on a wide bike path! Riding 395 north after lunch, I remembered that this portion of the route is a rolling climb; eventually, I was rewarded with a 1000 foot, 40 mph luge run down to Hwy 20. 20 follows the middle fork of the John Day River for about 50 miles with about 1000′ elevation gain, but the grade is so low and steady I found I could average around 12 or 13 mph all the way up to the junction to Hwy 26. I camped for the night further up the middle fork than we did last year at a site that was more open, hoping for early morning sunshine to warm my tent. After sluicing down a bit in the ice cold river, I ate supper and hung out around the fire. A flask of homemade Kahlua made by my cousin hit the spot and I turned in early. The winter sleeping bag was definitely too warm…better than being cold though. Day 3) Arose for the third day’s ride to clear and cold skies. At the turn west on 26 I encountered the Austin House Café’ & Country Store at Austin Junction—they have truly epic and delicious burgers. This is a must stop for any cycle tourist doing this route! Last year, I wasn’t able to eat at Austin Junction (sadly, closed that Monday) and ended up bonking big time on the steep climb to the top of Dixie Summit. Only the the better part of a bag of mint M&M’s kept me going. This year, fueled by the mega burger, I fairly flew to the top. In fairness, this year I was in much better riding shape than last year, it wasn’t all the burger. I’ve set “bike shop” hours (12-5pm, Wed-Sat. 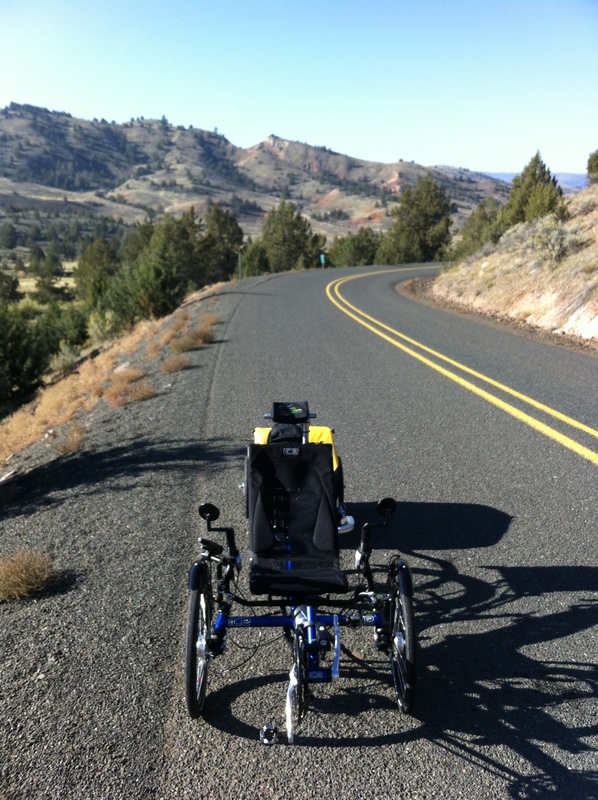 )because I love to ride and stay in shape—I want to maintain my enthusiasm for riding recumbents so I can share that passion with my customers and friends. The descent from Dixie summit is near 2000 vertical feet and always a blast, whatever trike you’re riding. Averaging about 40 mph for most of the way down to Prairie City, I was passed by only one car and was able to fully take in the beauty of the valley as I blasted downward. Prairie City has a town campground where I stayed on my first long bike tour in 1977 when I rode the Trans Am route (then called Bike Centennial). The campground is still there and has undergone some improvements over the years. After setting up my little solo tent for the night, I rolled back to the downtown area (all three blocks of it) and went to what has got to be the absolute best Mexican restaurant ever, (and believe me, I’ve been to my share) Maria’s. The carne asada is to die for and the flan is made from scratch. I even partook of their perfect margaritas, something I will only do when riding a trike back to camp-no worries about falling over. Day 4) After another frosty night, I arose to a lovely heated bathroom and shower, then packed up camp and rolled into town to Chuck’s Diner. The place has awesome breakfast and I was treated as one of the locals by all the friendly folks having their morning coffee. Prairie City Oregon is one of those few small towns that are not only surviving but thriving. It has vibrancy you don’t often see in small rural areas anymore. The last stretch of miles along Hwy 26 to my car in Dayville was a very gradual downhill most of the way, so I was able to keep up a pretty good pace of 15-18 mph without a lot of effort. With winter closing in fast, I knew this would probably be the last trike tour I’d fit in until next year. Arriving finally back at my car, I felt a bit of sadness that the ride was over so soon. 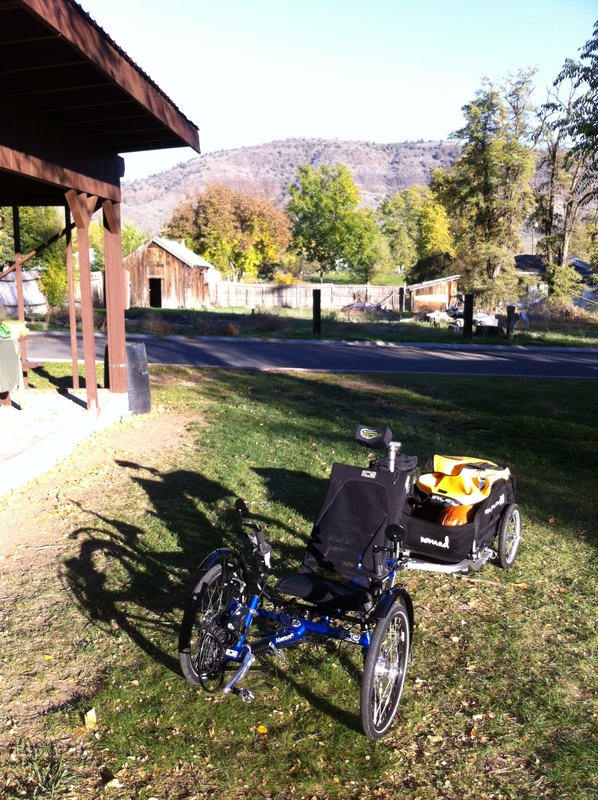 After loading my ICE trike and trailer and heading for home, I had several hours to think about my experiences. Solo: less complicated, freedom to do and go as I pleased, less pressure to ride at another’s pace so I didn’t keep them waiting (usually a self-imposed pressure), more introspective experience. Company: safer, someone to drink scotch with around the campfire, inspiring riding with a faster friend, a shared experience. Panniers: less likely to carry too much crap so lighter, faster, etc. ; also more aerodynamic than a trailer. Shorter overall length and less cumbersome in some situations (such as transporting everything up to a second floor motel room). Trailers: as easy to pack as a car trunk. Open it up and toss it in…Can carry a small dog in some designs if you want your best friend to tag along; motorists think you might be pulling a small child behind you and may be less inclined to kill you because of that. And, You get to carry the case of beer back to camp! Greenspeed GT3: light, nimble, zippy and fun to ride, rear rack made especially for the trike keeps the gear close to the 16″ wheels so CG is kept low to the ground, the handling with 30 lbs on the back is fabulous. 16″ wheels seem to climb really well. Solid mirror mounts left and right and very well designed fenders that don’t move, shake, vibrate or do anything but keep the rain off your bad triking self. A bit squirrelly handling over 45 mph., probably because of the small wheels and short wheelbase. For me, most comfortable seat ever! The lumbar support is perfect, the mesh is suspended with shock cords for mega road shock dampening for a non-suspended trike, and the way the seat angle goes to vertical at the top means you have a reclined and aerodynamic seating posture without having to use a neck rest to support your head. Folds up nice and small for easy transport. Not much ground clearance for off pavement riding. 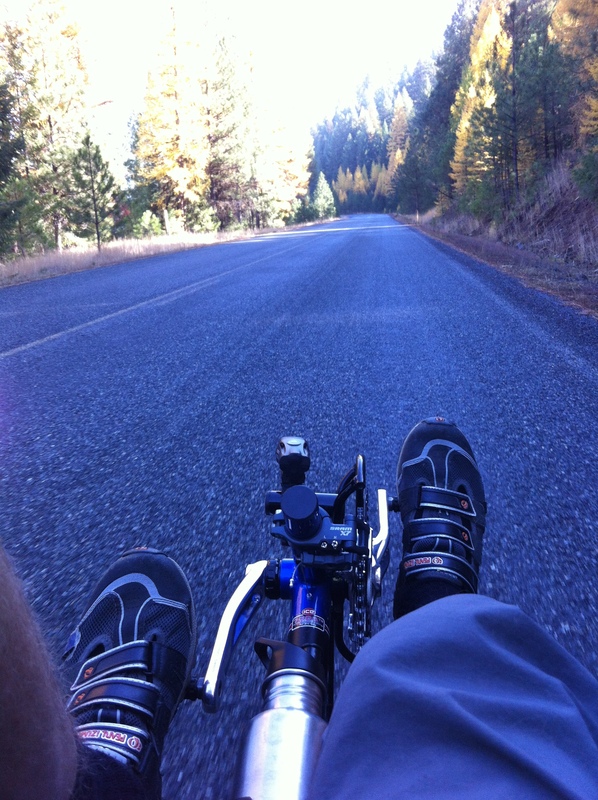 For some, riding rough and broken pavement may prove too harsh a ride. High ground clearance for off-pavement riding when needed, and better vision for seeing the scenery over guard rails. Adjustable seat angle. I had it more vertical for steeper longer climbs and more reclined for punching through headwinds. Stable handling over 45 mph but higher CG than the Greenspeed so cornering requires more care. With full suspension, riding rough cracked pavement and especially cattle guards means higher comfort. 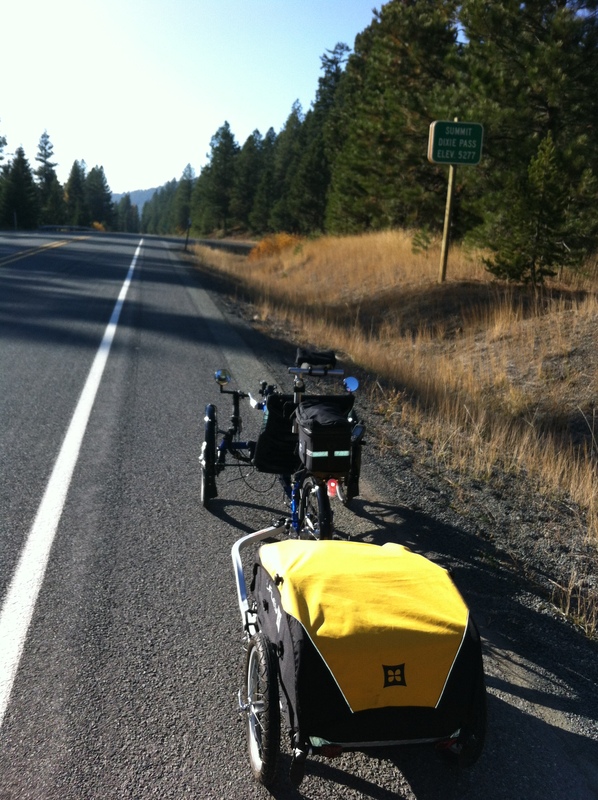 The ability to carry a side-mounted handlebar bag is a huge plus for a serious touring trike. Only one other trike manufacturer, Azub, has this factory option on their trikes. If you are touring long distances, especially if you are using the excellent Adventure Cycling Association maps for your tour, you need to have easy access to your maps at every branch in the road. Plus it’s a great way to have quick access to phone, wallet, rain jacket, snacks and so on. The Adventure is heavier and a bit slower overall than the Greenspeed. The bottom line is, pretty much whatever trike you have, you can tour on it. I started riding trikes specifically because I suspected they might be the best of all possible ways to tour under my own power. Almost ten years later, I’m so glad I took the three-wheeled plunge! Now I own a recumbent cycle shop and I’m helping folks find the right tools to equip themselves for their own adventures. 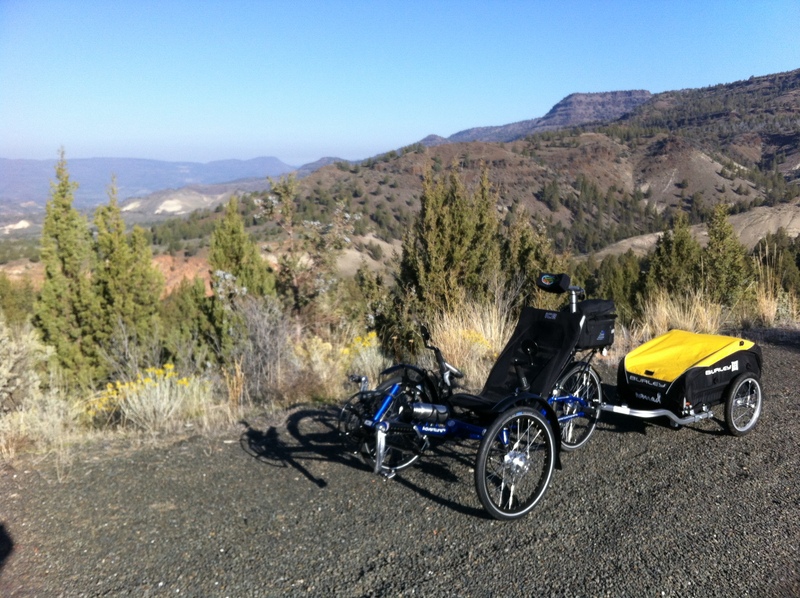 Many of these folks might not be capable of riding a DF bike or even a recumbent bike long distances, especially carrying their own gear, but a trike makes it possible for everyone to venture out into the great wild unknown and find themselves renewed.